There are a few methods to delete files from the computer. In Windows, we can hit the delete button or right click any folder or file and select delete to delete the file or folder. By default, this will take the file to the recycle bin and then we can empty the recycle bin to delete the file permanently. But this will not completely delete the file from the computer. It remains on the hard drive until it is re-written by some other data. 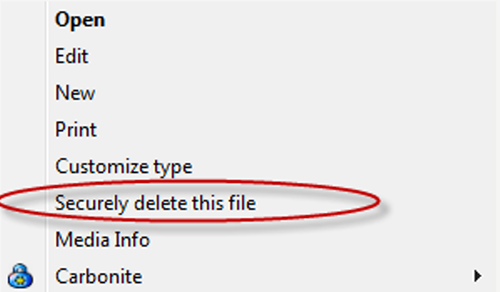 One method to delete the file without taking it to the recycle bin is to use Shift-Delete instead of only delete. But this also leaves the files on the hard drive. There are many programs that can securely delete files permanently from the computer but the problem with them is that they need to be installed on the system in order for them to function. If you’re using a public computer, it’s not always possible to install those programs. Selecting the first check-box “Explorer context menu file/folder links” will add a context menu item so that you can right click any file or folder in order to securely delete it. You can take it with you in your USB drive and use it on any PC. If you want to use it permanently then make sure that you unzip the utility in a folder in order for it to function properly. RightDelete can be downloaded from Softpedia.